We have found our treasure and it is here in Burundi. What a beautiful country it is! 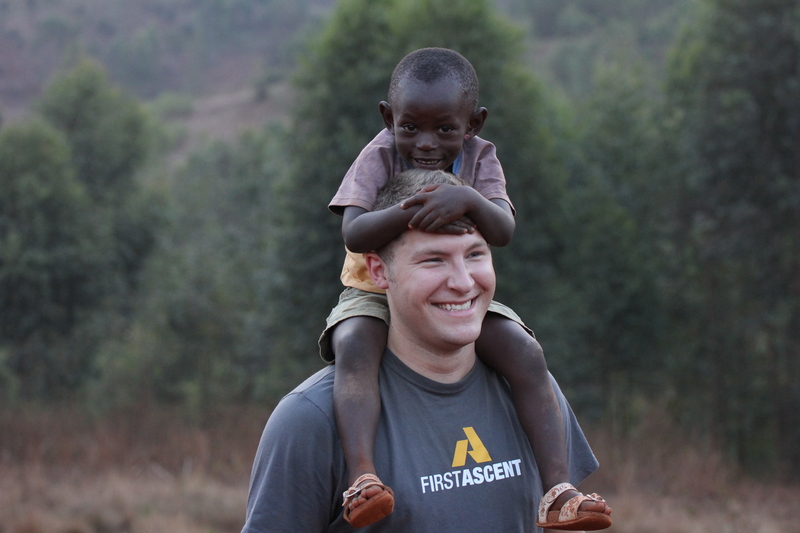 The land is stunning and the Burundians are the most genuinely kind people we have ever met. We have been warmly embraced wherever we go. After 2 days of travel (Edmonton – Montreal – Brussels – Bujumbura) we arrived in Bujumbura, the capital city of Burundi, where we spent a day there seeing the city and meeting wonderful people. Simon Guillebaud, the UK missionary who has been influential in our connecting with Burundi, and his family moved back here to Burundi after being away for 3 years raising money. Simon and his family ended up on the same flight from Brussels to Bujumbura with us, so it was a wonderful surprise to reunite with him and to meet his family (sidenote: his 3 little kids have british accents, which is the best thing ever!). Freddy, the Burundian man who is the head of YFC Burundi, met us at the airport and has been our host for this trip. Seeing his face waiting to greet us in the airport was beautiful! It has been amazing getting to know him better and spending quality time with him! The most amazing part of the trip has been visiting Gitega, the city in which we will live. It is a bustling town intermingled with peaceful green valleys and deep red earth roads. We already feel at home here. When we arrived at Homes of Hope orphanage, we were greeted with loving hugs from all the children followed by a lot of energetic play time! Most of these children have lost their parents to the genocide and some to AIDS. They are beautiful children, who are growing up with love and affection and the word of God. These children have been given hope and are being raised up to be the future leaders of this country, growing up as Hutus, Tutsies, and Batwa together in peace and love. The clinic is absolutely amazing! Seeing it for the first time was greatly anticipated and almost unreal. A lot of thought was put into the construction of the clinic, as it will fullfill all of our needs as a building. There is running water in the clinic now, which is a huge blessing. However, there is no power to the clinic, so we are needing to raise more money to purchase solar panels, which are what is used in the rest of the Gitega complex. We were able to go through all of the supplies that’s currently at the clinic and catalogue what we have there already and what we will still need to add to the clinic. We also went through each room and decided what it’s best function would be. I, Nadine (Type A personality), can’t wait to start organizing the clinic in January! While digging through old donation boxes, we found old military dressings in a military crate from 1943!!! Pretty neat to find! It is wonderful to have Josh’s dad, Craig, here to help us sort through supplies and how we can be creative with it, as well as discover useful things that we will need to acquire. Josh and I met with a a couple of people to plan out our home. The plot of land has already been levelled! It felt surreal to see it for the first time, watching the Burundian women as they levelled the plot for us, knowing that money that we raised is going directly to paying these people and providing jobs for them. It was a beautiful site to see! Our home will be built next to the Homes for Hope orphanage and near to the clinic…and it just happens to have the most amazing view of all time! And there happens to be goats…which I love. I may be in love with a little baby goat, who I named Olive. Church was an amazing experience. Africans definitely know how to worship the Lord! The music was lively and there was a lot of energetic dancing! It was great! Something that really struck me, was when the pastor preached to everyone before he started the sermon, to leave their worries behind, like being unsure if you will have enough food today. That is definitely something that most of us have never needed to worry about. And so many of my worries seem like nothing in comparison. It was a beautiful experience worshiping the Lord together. The sermon lasted 4.5 hours!!! They just love praising God! It has been humbling to see what God has done through one man, Freddy. – There may be a lot of spiders with very long legs here and I may or may not be incredibly afraid of them…Josh and Craig have been clearing rooms for me before I enter them. It sure is nice to have the boys around! – The showers are COLD!!! It helps to wash each limb separately. Freddy was sweet enough to boil me some water the other night for a nice hot bucket bath. – It’s outstanding what people carry on their heads and load up on their bikes!!!! – Our Kirundi language learning is coming along…the kids are the best teachers! – We saw wild HIPPOS!!! Sorry we weren’t able to post many photos. We had a bunch lined up to show you but the internet would not allow it. We will for sure be posting lots of photos when we are back in Edmonton. Oh you guys this is a great post, great pictures and great news. Your love for the people is so evident. Praying for you, and for quick adjustments to the food. Ben and I played games with the food to pass the meals, but it eventually worked…for me, he was always fine! Anyways, enjoy it all….can’t wait to connect on your return. So glad you made it safe and sound! Wow!!! What an awesome experience!!! Keep safe and well over the next week!. All our love Cathy Rob Sarah and Jacob. Glad to hear of all the great things going on over there. You are in my prayers everyday! Can’t wait to hear more about it when you get back! Blessings! Hi Nadine, God is good! No one can deny that specially those who have experience his amazing grace. I really enjoyed reading your email. You are fulfilling my dream!!! The shower thing? Yap, I was there at one point in my life. You are doing the right thing by washing each limb separately. We cannot wait to hear your stories. Let’s get together when you are in town. Thanks for sharing – so good to hear from you and know that you are so happy in the centre of God’s will. Praying for your health and safetly. Look forward to seeing when you get back and and hearing more of you exciting journey – you are an inspiration to us. Glad you guys got there safe and sound. This will be a tremendous experience for you both. Best of luck an hope all goes well. How inspiring to hear about the wonderful work you are doing. Good luck and God bless! So lovely to hear your news !! Sounds amazing! I am very proud of you both !! And a little jealous … Africa is a magical place – now that it’s in your system you’ll never get it out. Enjoy every minute – the good times and the tough ones … In Africa there are many tough ones ! It’s just a way of life there. But yet the people still manage to smile despite the hardships and they overcome. God bless and I look prepare to seeing you when u get back.